Another ALDI Catalogue that is designed to be a source of your happiness. 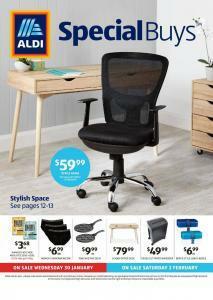 Aldi Special Buys Week 5 deals valid from 30 Jan and 2 Feb. Let's examine some of the categories. First of all Office furniture and equipment part of the catalogue has an amazing product range. Excellent quality and wonderful pricing are offered you to create a peaceful environment for yourself. Also, you can check the underwear category which is stylised. They are made of cotton for your comfort. You should take the time to update your lingerie wardrobe with new and beautiful favourites. There are different kinds of items such as men and women socks, brief, under a tee, t-shirt bra, trunks or boxers you can find in the catalogue. Underwear sale starts on Wednesday 30 January. Here comes an irresistible gift for your loved ones and the best way to indulge yourself. Delicious chocolates are waiting for you on the pages 8 and 18 of the catalogue. Share your love with chocolate on Valentine’s Day. The first product you need to have is a wok to make wondrous Asian food. If you want to spend a delicious experience you should also get a rice cooker and grill plate. In addition to these kitchen utensils, different kinds of sauces, herbs and fry vegetables are necessary to elevate excitement. Finally Some of the good picks are listed for you. Have a nice shopping.